As a part of the library development program by Rainbow Reading Gardens, I have to deliver a number of issues to the school to raise their awareness on the importance of developing the habit of reading. I often receive comments from teachers as well as principals regarding how the students from Grade 1 and 2, who are mostly still learning how to read, do not read the text of the books when they are at the library. They only turn one page to another to see the pictures. Later on, I try to explain that looking at the pictures even without reading the text is not at all a problem. Pictures, in fact, can trigger their love to books. While I was giving monthly Support and Monitoring at SDK St Yosefa Labuan Bajo in mid July 2017, a student from Grade 1 was busy selecting a book to read at the library. She finally picked a book called Sayang Binatang. With curiosity on her face, she approached me and handed me the book. “Kakak, would you please read me this book?” she asked. Seeing an excitement on her face, I took her to a wall and sat her down. I started reading the book before her. I remembered clearly that one of the material Rainbow Reading Gardens share during library management workshops is the urgency to develop the habit of reading through a child-friendly library. The habit of reading is defined as the moment when kids are willing to read, read often, enjoy reading, both at school and at home. I smiled from ear to ear at that very moment. This is what Rainbow Reading Gardens has been working on with schools. 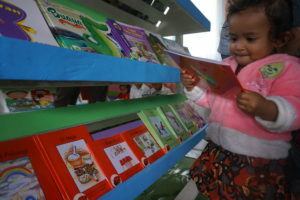 Children are expected to enjoy books, even before they are able to read the text. 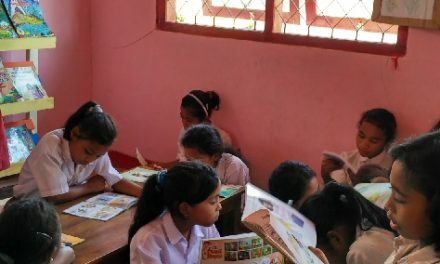 Answering the child’s request, it turns out SDK St Yosefa Labuan Bajo has the policy to allow students from Grade 1 to check out books, via their parents. Parents are supposed to come to the library to check out books, while the librarian informs them the library rules and system in the library. This is also to emphasize that school is not the solely responsible party for children’s education. The love to books should be supported by adults in their surroundings, including parents. It is indeed true that not every child has access to books with good pictures. Not every child has parents who willingly read them books. However, it is never wrong if we do our best to provide much more options of books for these children. It is never wrong for adults to spare their time and energy to fulfill the curiosity of these kids on books.